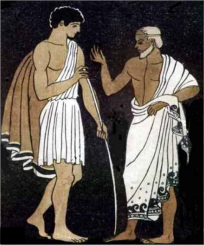 In Greek mythology, when Odysseus left for battle, he asked his friend Athena, the goddess of wisdom, to assume the male form of Mentor to watch over and guide his son while he was away. From that time, the name has been used to describe teachers, guides, role models, advisors, and counselors. Aristotle mentored Alexander the Great in rhetoric and literature and kindled his interest in science, medicine, and philosophy. Centuries later, international aviation pioneer Sir Freddie Laker mentored Sir Richard Branson, who went on to become the billionaire creator of Virgin Atlantic Airways©. From ancient times until the present, mentor-protégé relationships have been instrumental in creating great leaders, building successful businesses, and fostering the transfer of knowledge and wisdom from seasoned individuals to those just starting their professional journeys.